Are you watching scary movies now or stuffing Halloween grab bags for the kiddies? Well, take a break and enjoy this animated spectacular from KJ92058 on YouTube.Com. This video has already received well over four million hits on YouTube. Amazing stuff! I always marvel at the creative genius that exists among us. It really makes the world an exciting place in which to live. 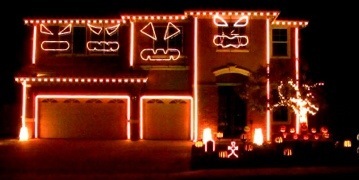 Enjoy the Halloween Electric Light Show below. And, if you have links to other Halloween spectacles, please visit the comments and add your links.